Very early in the history of veterinary science the French writers separated diseases of the brain into two distinct forms, which were designated by different terms - cerebritis when the substance of the brain was affected, and meningitis when the inflammation attacked the membranes (meninges) which cover the brain. The necessity for the distinction was at one time disputed, but it is now quite clearly recognized; in fact, the two conditions of disease are indicated by totally different symptoms. 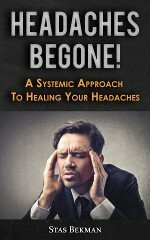 When inflammation affects the intimate structure of the brain the prominent signs are loss of sensibility and consciousness more or less complete, and various degrees of paralysis. None of these symptoms are present in inflammation of the meninges, of which violent excitement, pain, tenderness, delirium, and convulsions are the chief manifestations. In the case of disease being confined to the brain there is seldom any marked disturbance in the circulatory system, but in meningitis both the pulse and respiration are excited in a high degree. To put the differences concisely, it may be said that in disease of the brain substance, diminished sensibility, loss of power of motion, and deranged volition are the characteristic features, while inflammation of the investing membranes of the organ is indicated by spasms, convulsions, violent pain, delirium, and frenzy. Impaired consciousness may arise from disease of the stomach. The affection which is described as " stomach staggers " might probably be, in popular phrase, referred to as a sick headache due to an attack of indigestion, the brain being sympathetically affected. 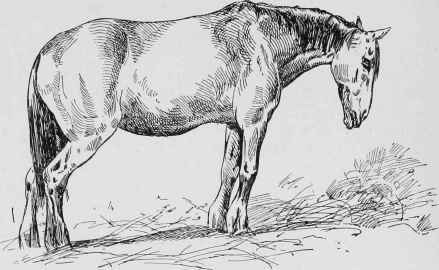 The symptoms of the disorder are generally observed after a full meal, which the horse probably swallows rapidly owing to a previous long fast. The first indication is a slight dulness, the eyelids being drooped, and the nose rested against the manger. If compelled to move, the animal staggers; hence the name given to the disease. Fig. 177. - Sleepy Staggers. In very pronounced cases the drowsiness may be followed by delirium, or sometimes severe convulsive twitchings of the muscles. Now and then a violent excitement supervenes, and the animal throws himself about in various directions in a condition of actual frenzy. In some of these erratic movements the horse may injure himself, or the attendant if he happens to come in his way, but it is evident that there is no intention to do mischief. The treatment of the disease, to be successful, must be adopted as soon as the first indications are apparent. The animal should be removed to a loose-box and freed from all restraint; food should be kept out of his reach, but he may be allowed to drink any quantity of water. In former times the treatment on which the greatest reliance was placed was the immediate employment of the lancet and the withdrawal of a large quantity of blood. This system, however, has been discontinued for many years past, and instead it is usual to rely on the administration of a strong-aperient, together with antiseptic agents, as hyposulphite of soda. Four to six ounces of solution of aloes, or more, according to the size of the horse, forms a useful purgative; and if the drowsy condition is extremely marked, aromatic spirit of ammonia in doses of from one to two ounces every two or three hours, while the condition remains, is likely to be effective. Benefit will also be derived from sponging or douching the head with cold water at short intervals, or by the application of ice-bags to the poll.